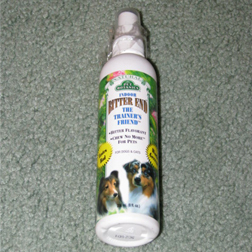 Dog and puppy odor solutions. Deodorizes smelly pet odors from the air as it evaporates. Solid composition - no tipping or spilling issues. Lasts up to 3 months when used as directed. Effectively controls 150-250 square foot area. 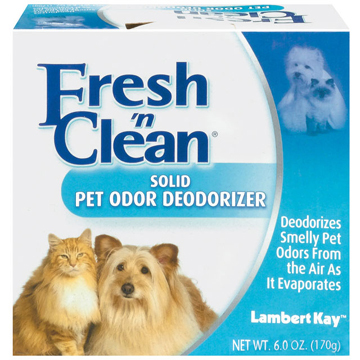 Is particularly suited for litter box and dog bed odor. Also works well against tobacco, sewer, skunk and many household odors. Tastefully decorated container is unobtrusive in any room of the house. 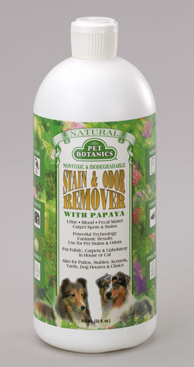 Deep clean and eliminate tough pet odors. 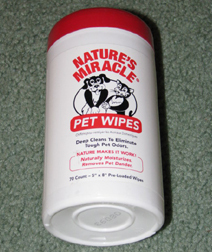 Naturally moisturizes and removes pet dander. 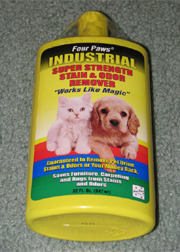 Industrial Super Strength Stain and Odor Remover. Four Paws Dog Cologne Spray 3 oz.